TULARE COUNTY – Agriculture is gaining S.T.E.A.M. with today’s youth. More than 1,300 Tulare County students submitted entries for Tulare County Farm Bureau’s annual art contest by the February 15 deadline. The goal of the contest is to promote awareness about agricul-ture in Tulare County and the importance of an abundant and healthy food supply. 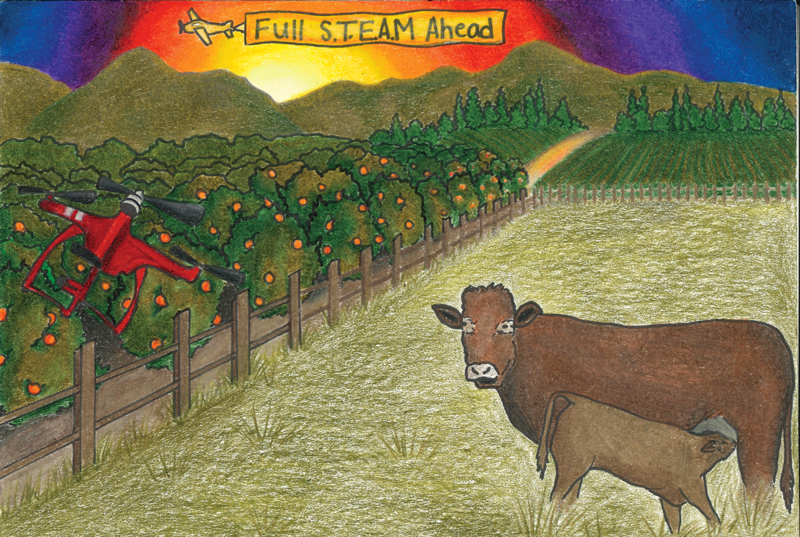 The students were asked to submit original artwork depicting this year’s theme, “Tulare County Agriculture…Full STEAM Ahead.” STEAM is a reference to the disciplines of teaching science, technology, engineering, art, and mathematics. Winners of the 2019 Calendar Art Contest hosted by Tulare County Farm Bureau (TCFB) with sponsor-ship from the Tulare County Office of Education was honored with a special presentation during a Board of Supervisors meeting on Tuesday, March 19. All entries were judged by a panel of representatives from the TCFB’s Education Committee. Winning artwork was chosen based on the agricultural content, originality, neatness and reproducibility. This year, the overall winner is Victoria Trevino, a 9th grader from Orosi High School, her artwork is fea-tured on the cover of the calendar and she receives a $50 cash award. Additional student artists, listed below, received a $25 prize and their artwork is featured inside the calendar as monthly winners. Additionally there are 12 art submissions in the calendar as “Featured Produce Recognition” images. They are: Bresayde Alaniz, 2nd grade, Snowden School in Farmersville; Bramble Riley, 10th grade, Redwood High School in Visalia; Caffarel Paula, 4th grade, Oak Grove Ele-mentary in Visalia; Lyla Carrera, 6th grade, Waukena Joint Elementary; Emily Felix, 8th grade, La Joya Middle School in Visalia; Eavan Ford, 8th grade, La Joya Middle School; Natalie Hernandez, 8th grade, Kings River Elementary in Kingsburg; Rien Torres, 8th grade, Valley Life Charter in Visalia; Naythen Tre-viño, 12th grade, Orosi High School; Julianna Valverde, 12th grade, Granite Hills High School in Porter-ville; Gerve Ann Viloria, 9th grade, Orosi High School; Isabelle Wu, 5th grade, Oak Grove Elementary in Visalia; and Katty Zhang, 8th grade, La Joya Middle School. Each year, the 12-month calendar (April through March) is printed and distributed to schools through-out the county and is available to the public at no cost. For a copy of the 2019-2020 TCFB Agricultural Art Calendar, please contact the Tulare County Farm Bureau at 732-8301. The culmination of TCFB’s art contest is one way the organization celebrates National Ag Day, which was celebrated on March 14, 2019.